Opening tomorrow (September 29th) at the Courtyard Gallery at the World Financial Center in Lower Manhattan, New York City is Rate of Change: Time and Space in Electronic Art as part of the New York Electronic Art Festival. The exhibition, which runs through October 24th, is presented by our Soho neighbor Harvestworks and documents the transition of electronic art "from the 20th to the 21st century." 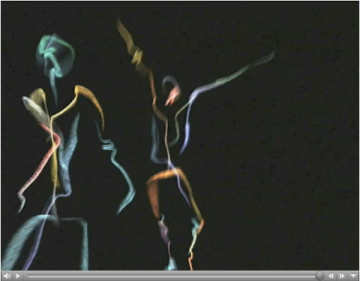 The centerpiece of the show is the 1998 virtual dance installation "Hand-drawn Spaces" by the late Merce Cunningham with Paul Kaiser and Shelley Eshkar. Click image below to view a brief excerpt from the virtual dance installation on Kaiser and Eshkars OpenEnded Group site. I remember hearing about Hand-drawn Spaces a long time ago. Glad I'll finally get a chance to experience it!